phone rang yesterday mornin’. it was jim, the man who built our kitchen, builds our dreams, i always say. he needed to stop by, pick up some hinges, make sure they fit the corner cabinet he’s building for my dishes, the ones stacked in moving boxes in the dark corner of the basement for four years now. i am nearly certain plates and cups are broken. it would defy all of newton’s laws for that fine old china not to be broken, what with all that’s been dumped on its head. ahem. back to jim, and his stopping by. last thing i said before we hung up was, “i’ll crank the griddle.” he laughed. he knows that the griddle is synonymous with grilled cheese, and grilled cheese around here is synonymous with jim, fueling jim, fueling him for years, in fact. in the latest installment of jim’s-grilled-bread-with-cheese, during the 12 months that was supposed to have been three that it took to build our farmhouse kitchen, i musta slapped, slathered, sizzled some 1,000 grilled cheese. gone through 500 loaves of hearty wheat, nearly as many bright orange blocks of cheddar, enough butter to charm a cow. 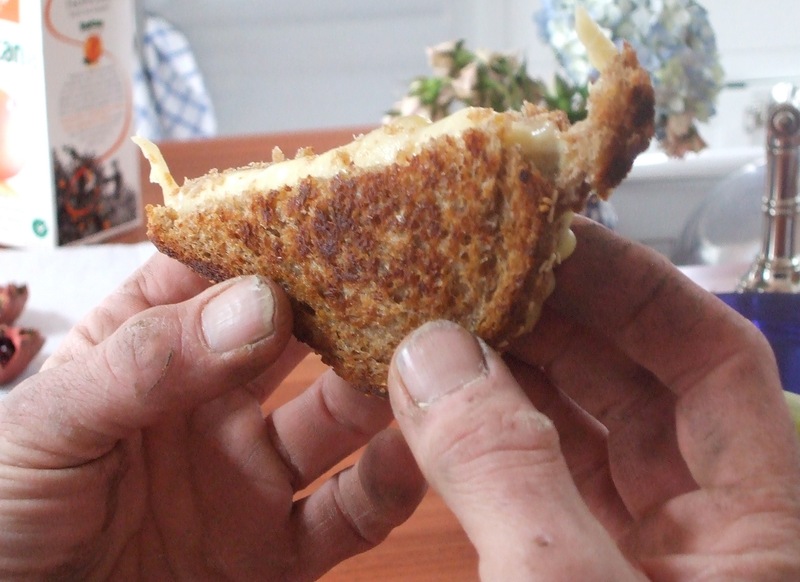 every day, round lunchtime, even on the days when we were inhaling dust or ducking under dripping wires, i cranked the firehouse stove i call my own, and i sizzled up at least three if not more grilled cheese. then, on paper plates some days, jim & crew shoved aside just enough saw dust not to get more crunch with their cheese, and sat down to lunch. many a day, i sat down too. and the grilled cheese always sealed the deal. always said the thing unspoken, though i’ve told it to his face plenty of times, and in print in the newspaper, too. the grilled cheese told jim & crew that they were not some hired workers, they were integral, essential, pretty much part of the family. if they could build me my dream, hammer through headaches and near frostbite, for cryin out loud, jigsaw through knicked thumbs and delayed orders, powerdrill through the hassles of a stolen van and a lifetime’s lost tools, i could slap cheese on bread; butter; grill. to be honest, not every day was a happy day on the long road to the farmhouse kitchen. at least one or two days jim wanted to kill me (like the day we discovered that the cabinet doors i’d described and the ones he ordered–and was starting to hang–were decidedly not the same). but through it all the cheese was grilled, the apples were sliced, and in the end, the jim who walked in yesterday, pulled out a stool, sat down and bit off a corner of my grilled cheese, he’s one of the dearest hearts in my life. we endured, fueled, in good measure, on that oozy cheese. it just seems right to me, and food for more thought for another day, perhaps, that the souls you invite into your home, to build your home, to wire your home, to get the toilet flushing, they are part and parcel of the woodwork, the wiring, the very innards of what makes your house not just a house but a very live theater with all sorts of characters who fill the stage with their charms, their quirks, their persistence and their considerable capabilities. it is a bond not paid in dollars. it is far beyond obligation. it is, far as i can tell, a kind of love best served crunchy on the outside, oozing in the middle. i’m curious, have you too forged bonds with folks who make your house keep ticking? or, if you’re a soul who does keep houses ticking, how’s it feel when you’re made to know, in no uncertain terms, that you are, simply, indispensable and far beyond just another worker hired for the job? p.s. those are, obviously, jim’s hands up above, holding that grilled cheese. i love those hands, working hands. as i kept clicking, while he chewed, i was raving about the hands–knicks, calluses, rough spots, the whole shebang. he chuckled. said that was a first. said i oughta go watch seinfeld, some episode where someone–i should know who–becomes a hand model. oh well, in the comedy i call my life, jim’s hands will do. just fine. Wow,imagine if every worker was treated with even the slightest morsel of your respect and integrity. We would probably need a lot less lawyers! I just want people to say hello, introduce themselves and make requests, not demands. While on the other side of the Lake Michigan people actually provide sustenance.Amazing! hey, about those broken plates, if there are any, save ’em and make a mosaic. hey, i know those hands…he’s pretty amazing, isn’t he?